Most “classic” chocolatey desserts are certainly and undeniably unhealthy. 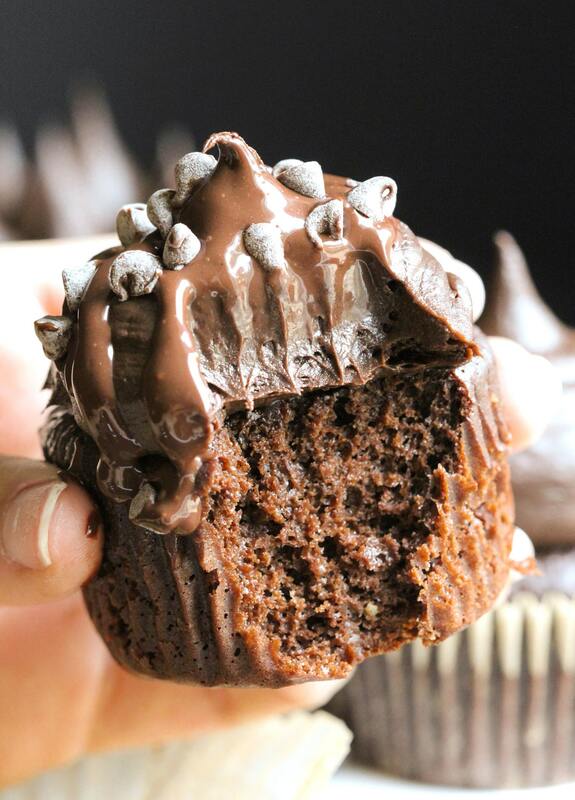 If you’re craving chocolate but don’t want all the excess calories, fat, and sugar that come in chocolate bars, ice cream, and storebought cakes, then make these Healthy Gluten-Free Chocolate Cupcakes! They’re 100% healthy, all natural, whole grain, gluten free, low fat, and low sugar with NO sugar added. Plus, they’re made without the butter or excess oil. 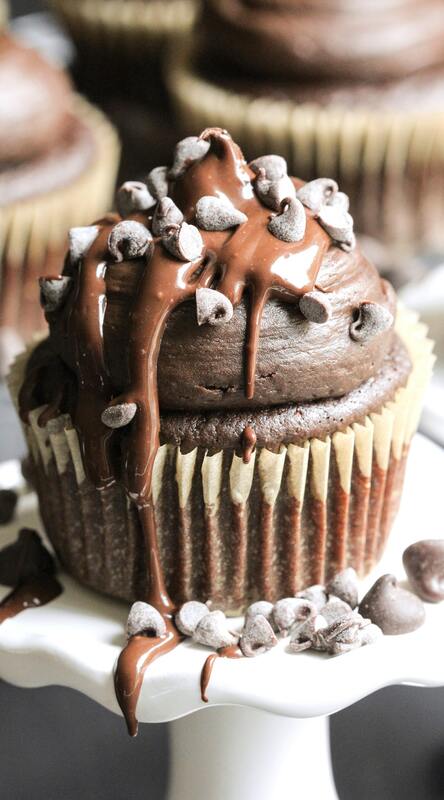 I love cupcakes, but sometimes they’re just missing something… and that thing is CHOCOLATE. One bite and you’d never know these are HEALTHY Gluten-Free Chocolate Cupcakes. They’re completely guilt free, but let’s keep that a secret. Oh, and they’re also low fat and low sugar. Just another secret to keep between us pals. These taste sinful but are sinless. Their fluffiness will BLOW. YOUR. MIND. Join me in this chocolate bliss. If you're craving chocolate but don't want all the excess calories, fat, and sugar, make these Healthy Gluten-Free Chocolate Cupcakes! They’re whole grain, gluten free, and low fat with NO sugar added. Preheat the oven to 350 degrees Fahrenheit and line your cupcake tins with parchment paper liners (these will stick to paper liners). In a medium-sized bowl, whisk together the sorghum flour, protein powder, oat flour, erythritol, baking soda, baking powder, and salt. In a small bowl, whisk together the almond milk, applesauce, eggs, vanilla extract, and stevia extract. In a large bowl, whisk together the melted chocolate chips and coconut oil. Pour in the boiling water and add the cocoa powder. Whisk until completely smooth (it should look like ganache). Slowly whisk in the other wet ingredients. Dump the dry ingredients into the wet ingredients and whisk together until completely smooth. Scoop batter into the prepared tins. Bake cupcakes for ~20 minutes, or until the surface of the cupcakes spring back when tapped. Transfer the cupcakes to a wire cooling rack to cool completely. Frost and serve! I frosted my cupcakes with Miss Jones Organic Chocolate Buttercream Frosting. I have also made this recipe in 2 8" cake pans, as well as mini loaf pans. The cakes will bake for 40 minutes, and the mini loaves will bake for 30 minutes. DAAYYYUMMMM only 90 calories per cupcake?! Plus 4g of protein and 2g of fiber?! I’ll take seven, please and thank you. I’m pretty much speechless at how good these are. SPEECHLESS I SAY. Actually, I can maybe get out a couple words out… CHOCOLATE FOODGASM. I really would like to try your recipe but are there any substitutions for the Sweet White Sorghum Flour, Xanthan Gum and the Stevia Extract wich are easier to get? 2) Replace the 2 tsp Stevia Extract with 1 cup Honey or Pure Maple Syrup + 3/4 cup more of the Granulated Erythritol. Oh my gosh. You are amazing. These cupcakes are amazing. I can’t wait to try them! So ADORABLE!!! I would eat this in a heartbeat. And I can’t believe how healthy you made these cupcakes — surely they’re breakfast-worthy!? These look spectacular! Lol do you eat sweets with every meal? ? Gosh, I wish I was your friend and you could make me goodies all day long! I love oat flour! It’s one of my favorite new gluten-free ingredients! Theses cupcakes look wonderful! I have used sorghum flour yet but I have been looking for a reason to buy it! This looks like a great reason! Yummy these look out of this world. Just tried these, omg how good! <3 I used chocolate whey protein concentrate instead of sweet white sorghum flour (I don´t know what that even is and do we have it in Finland :D) and made the frosting with Greek yogurt (0% fat) and 100% cacao powder. These were the first muffins I made, that turn out great! 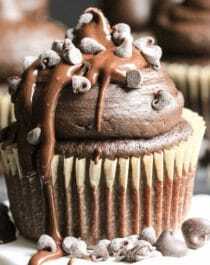 Gaaahhhh I love me a good chocolate cupcake! These photos are making me wish I had one right now! Chocolate is LIFE! Mmhmm these cupcakes look divine!